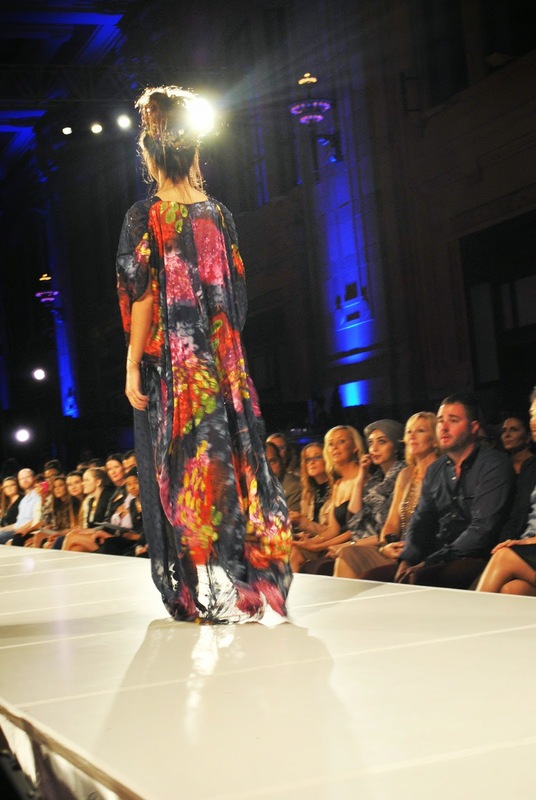 Last week I had the honor of attending some really exciting events leading up to all the runway shows for KCFW! Wednesday was a cocktail party where black tie attire was required. I've personally never attended a black tie event so I was thrilled for this opportunity! Then I started asking myself, what does one wear to a black tie event? Does it have to be black? Does it have to be floor length? I decided to go out on a limb. I wore a shorter length dress, that was on the cocktail side, and went for full on color. I'm so glad I did. However, when I walked in the room everyone was wearing black. I felt like I stood out like a sore thumb. Eventually, others arrived in various colors so I didn't feel like odd man out. When you think of black tie, what's the first thing that comes to mind? 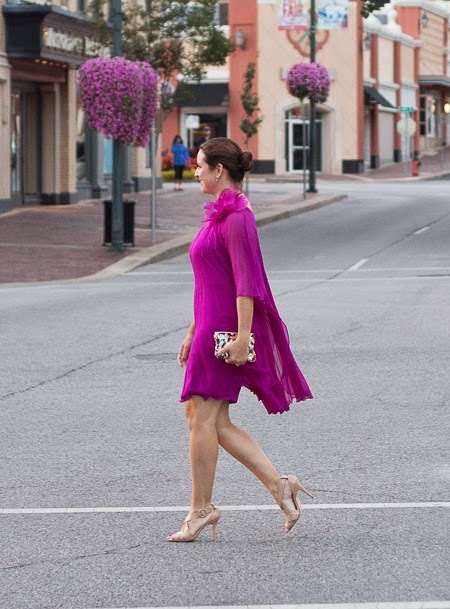 Would you have worn floor lengthy black or gone for a little more cocktail and bold color? Do you think I made the right choice? Personally, I can't think of a better look for me! 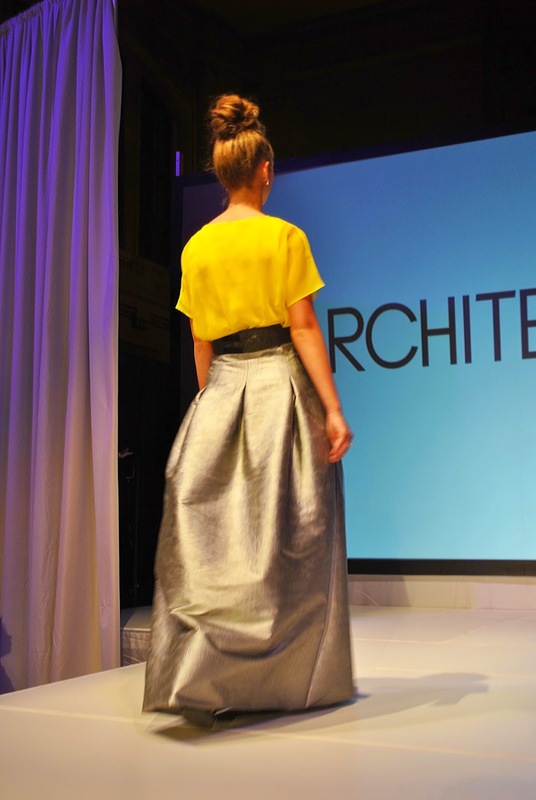 Photos Courtesy of Erin Barnes of Pretty, Polished, Perfect! 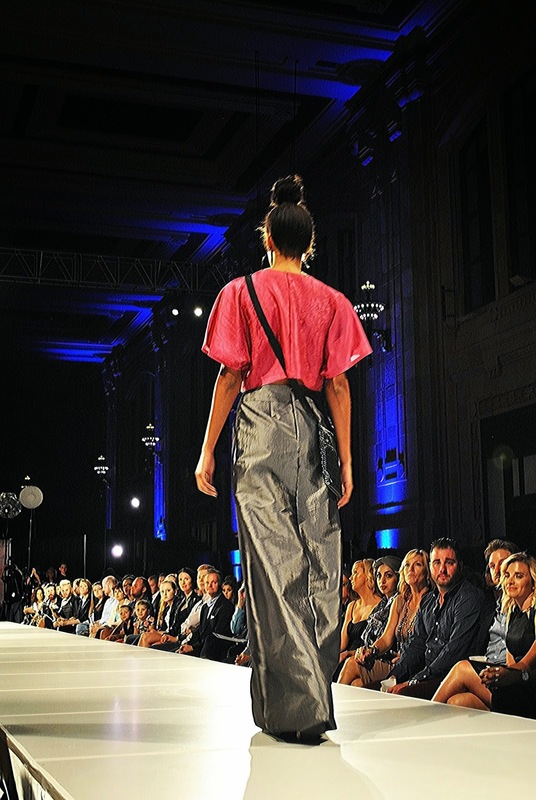 As most of you know, this week is Kansas City Fashion Week, and as part of the media, I have been invited to several events leading up to the weekend of shows. What an honor!! Wednesday night was a cocktail party at the Paolini Garment Company on the Plaza, where cocktail attire was a must, and what an amazing evening it was! 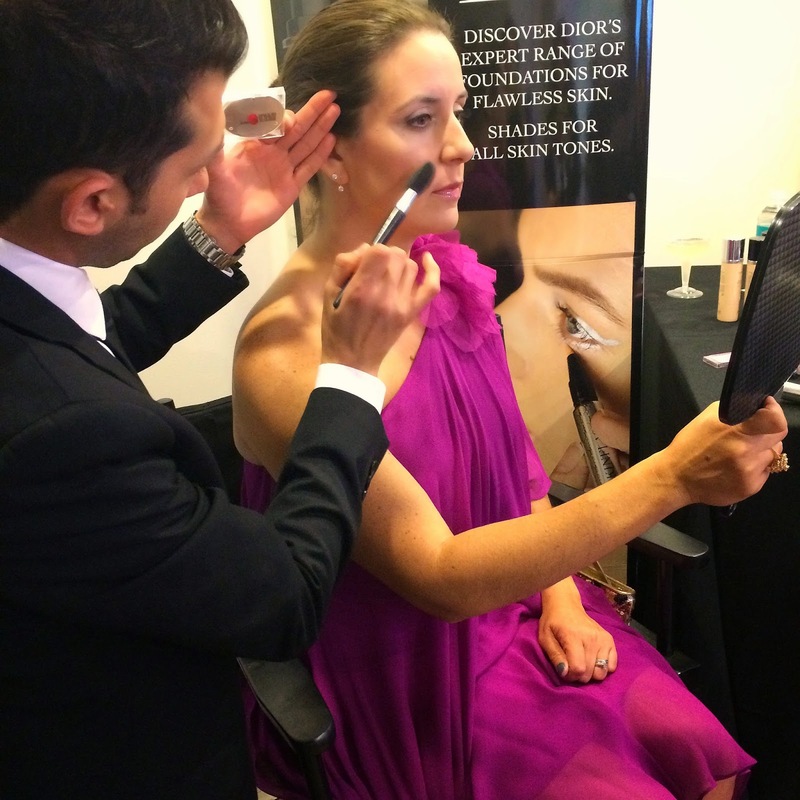 They served champagne, Kansas Clean Distilled Whiskey cocktails, and offered a complimentary Dior makeup bar for touch ups and tutorials, all while a DJ kept the party vibe going strong! 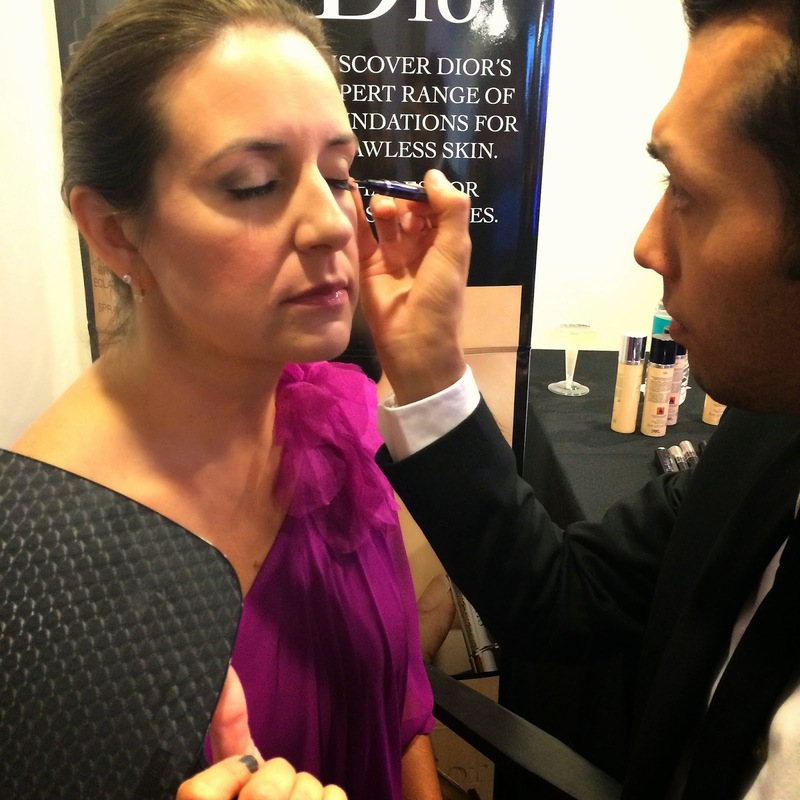 Before snapping some blog pics with Erin of Pretty, Polished and Perfect, I decided to hit the Dior makeup bar for that much needed touch up. Little did I know, I was going to get the royal Dior treatment! What started out as a foundation touch up, with the use of the Airflash foundation in 302 from Belinda, turned into a full on make-over and tutorial from Erik Martinez the local Dior Account Manager. He was amazing! Incredibly informative, extremely knowledgeable of the products, and so personable! Erik created a flawless look that had me wanting him on speed dial for all my daily makeup needs. Below is a little photo step by step of all the things he did and the products he used. 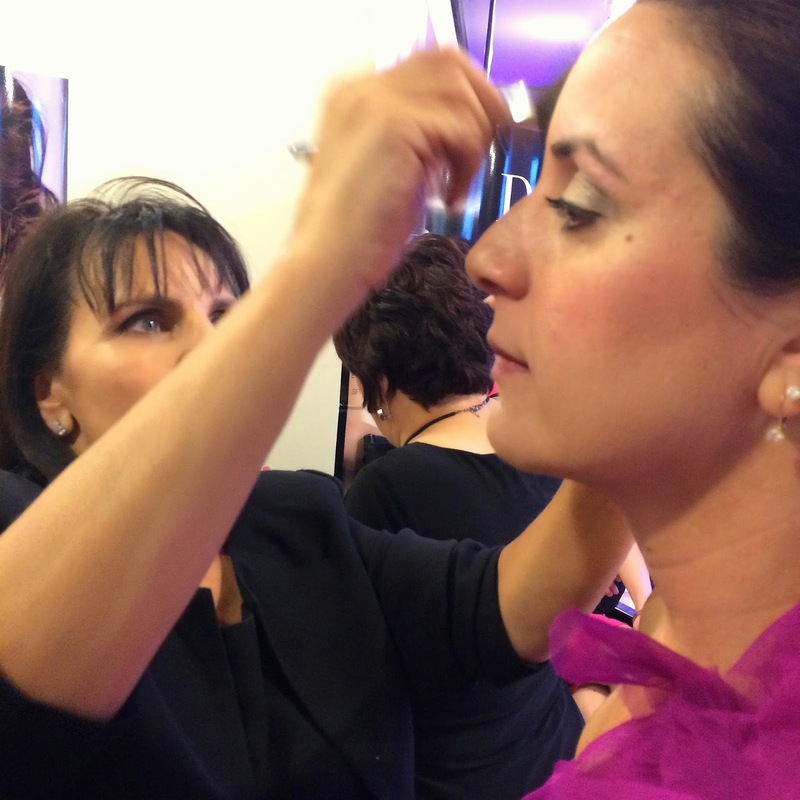 Here is Belinda applying the Airbrush foundation. This foundation gives you the look of an airbrushed application, but it's really just a manually applied product. It felt so silky on my skin, not tight like some foundations can feel. 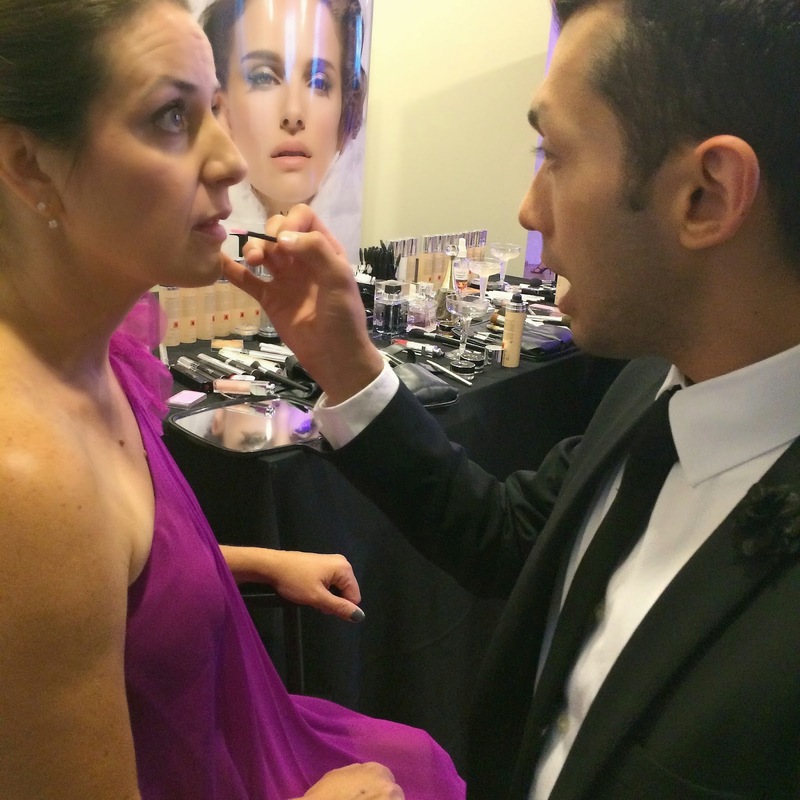 Here Erik is applying the Skinflash concealer to my very tired, very dark circled eyes! He told me to use a brush only. Applying with your finger tips is simply removing the product. You can bring it down as low as your check bones for coverage. This stuff gave me a glow I haven't seen in about 15 years! 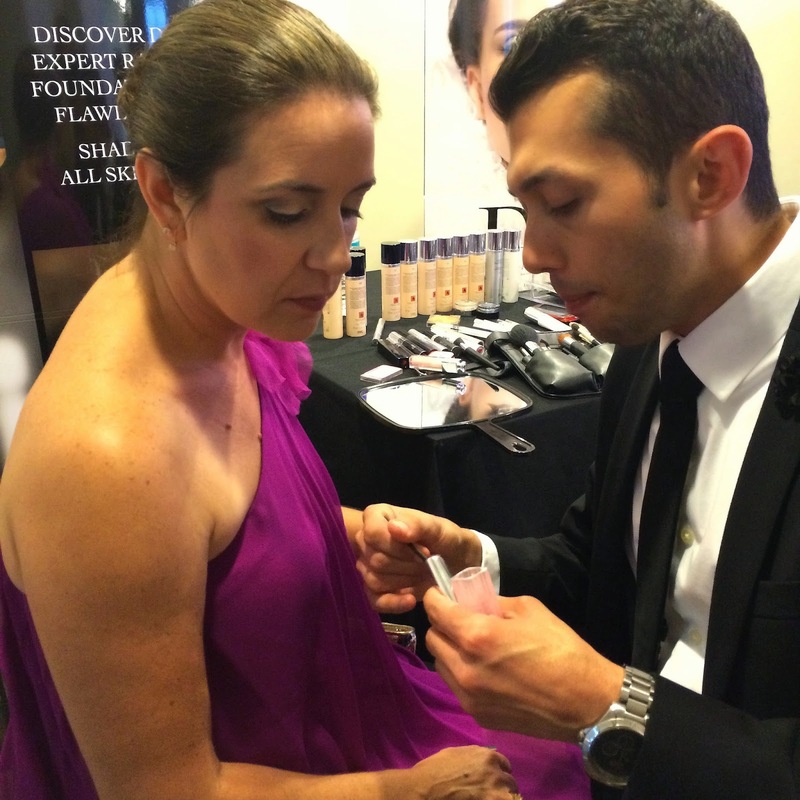 He gave me a J.Lo glow with the use of the Glow Maximizer. This stuff was amazing! My face lite up after the application! He contoured my cheek bones by using Sunset Highlight Powder in 004 on my actual cheek bones and Rosy Glow Blush on the apples of my cheeks. Word to the wise, only apply blush to the apples of your cheeks and no further! I'm guilty of that! This is definitely a tip I will use go forward! Here we are looking at the Lip Glow lipbalm. The lipbalm is a made-to-measure lip balm that beautifies and durably enhances the lips’ natural color. It was so glossy and soft. Not stiff and sticky like some balms can be. He then applied their Lip Maximizer over the balm. It's a lip volumizer, but nothing like those lip plummers from about 10 years ago! Lastly, Erik updated my eyes! He used an Artpen, a gel liner that created a thick, bold line and finished it all off with the Blackout Mascara. My lashes looked so thick and full! 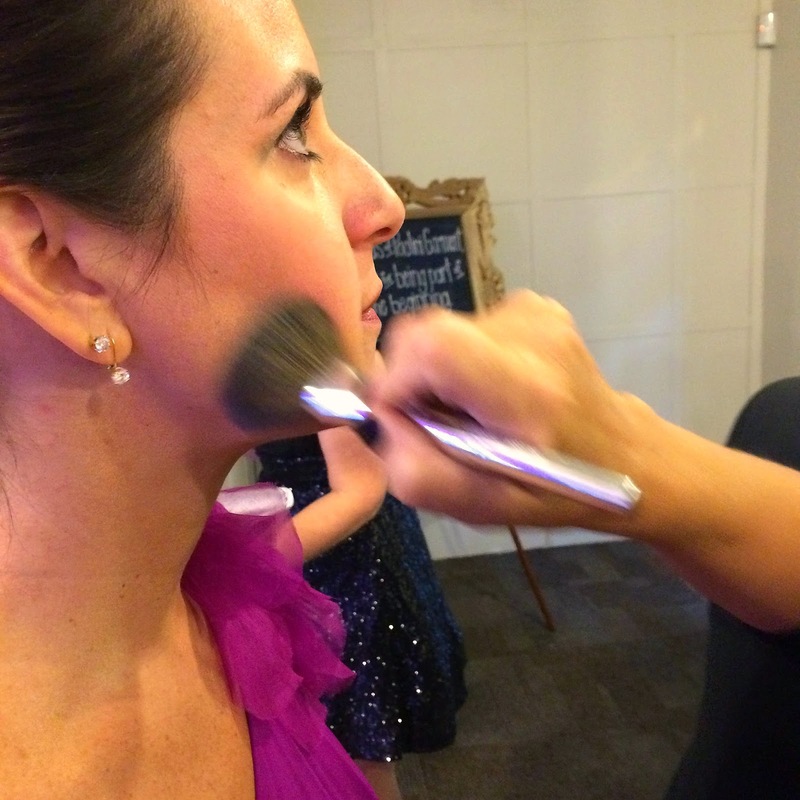 As you can see, the time spent at the makeup bar was so much fun! And here is the end result! 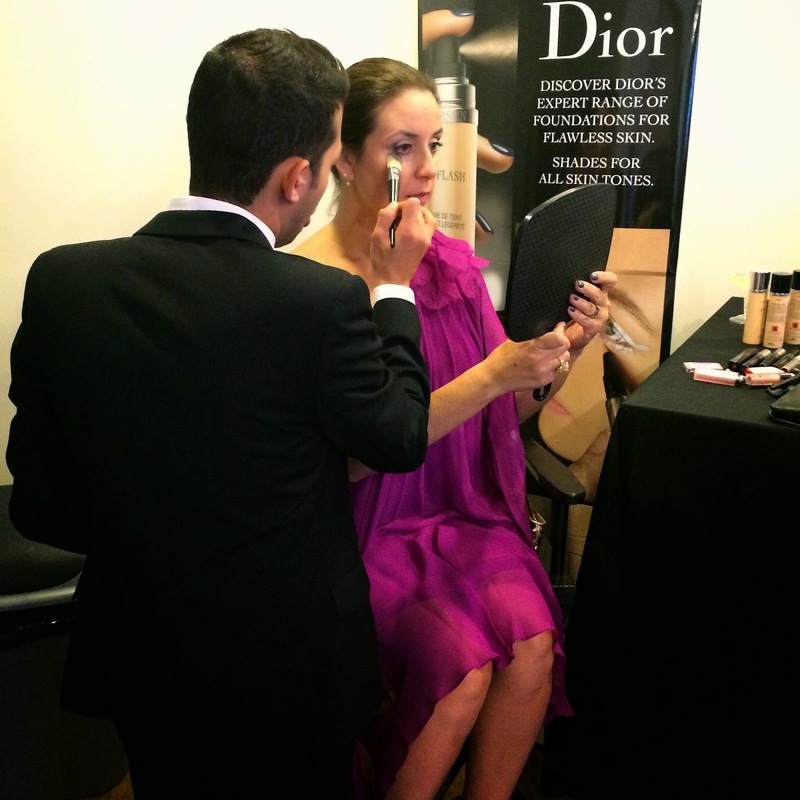 I think I look so pretty and it's all thanks to Belinda, Erik, and those amazing Dior products!! Happy Friday!! I hope you have a fabulous weekend! I can't wait for mine! 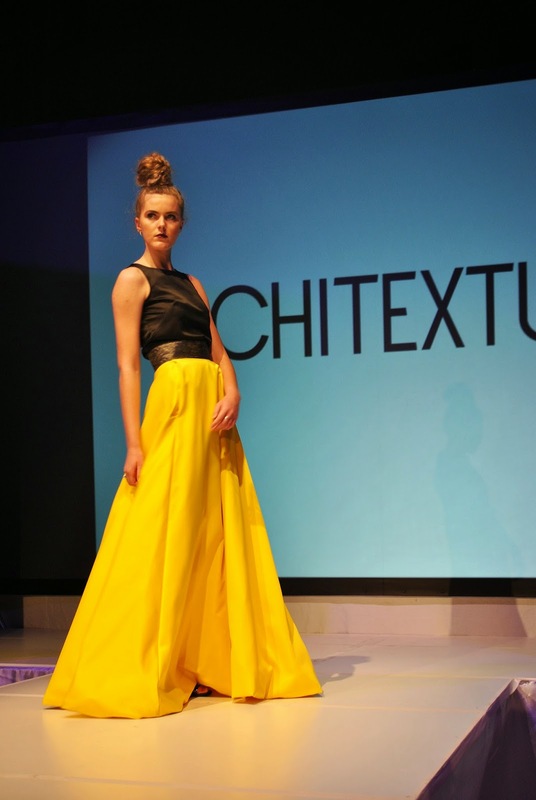 So excited to spend time with friends, bloggers, fashionistas, and some amazing designers! 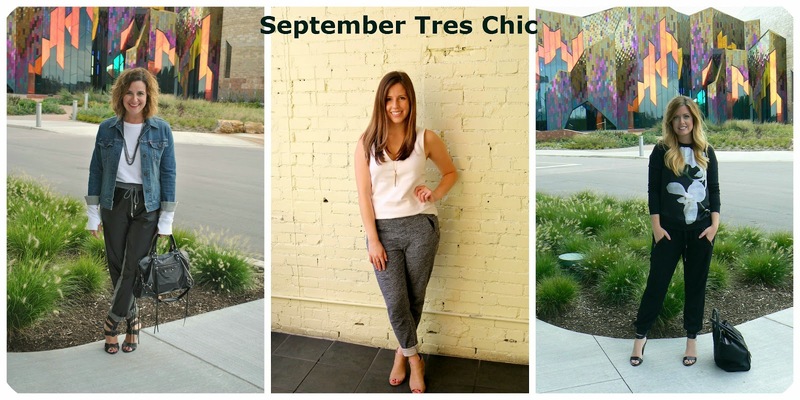 I told you yesterday that you would see joggers again this week, but this time I'm bringing it to you as our September Tres Chic! 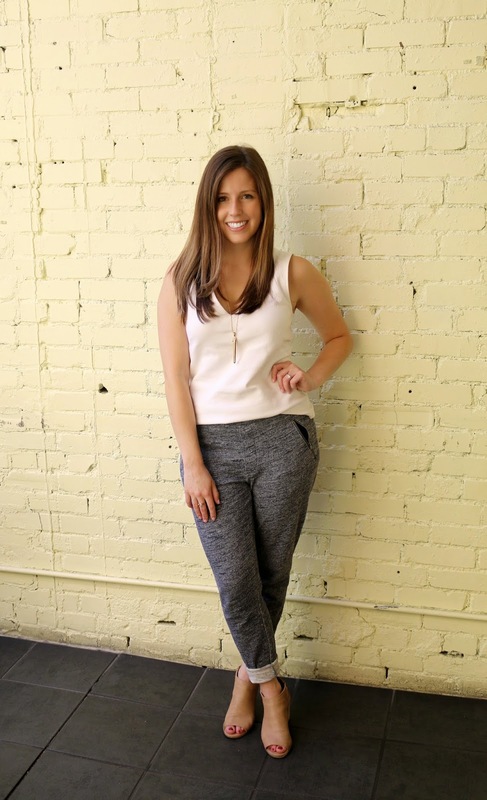 And, with the help of Lauren and Caitlin, you get to see two additional ways to style these rockin' pants! 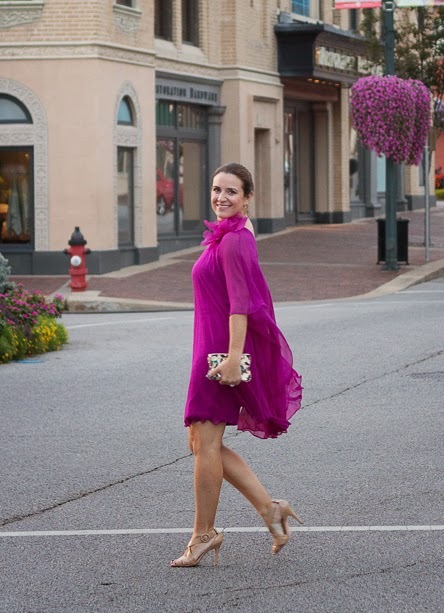 Lauren over at Classy and Fab Girl went totally casz chic and I love it!!! Definitely a look I will try to replicate! 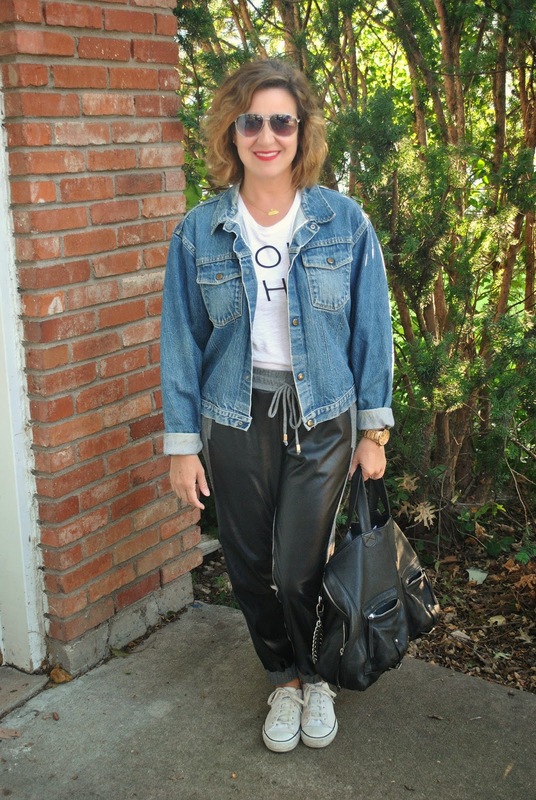 Caitlin of Gussied Up styled hers with the awesome Altuzarra Orchid sweatshirt from his collaboration with Target! So cute in person. Online did not do this top justice! And you aren't seeing things, we have the same backdrop! After blog pics, we grabbed sushi and gabbed for hours! Her styling choice for the joggers was perfect for the evening! And once again, here are mine! This is the original styling. One of many to come! This was probably my favorite Tres Chic styling! 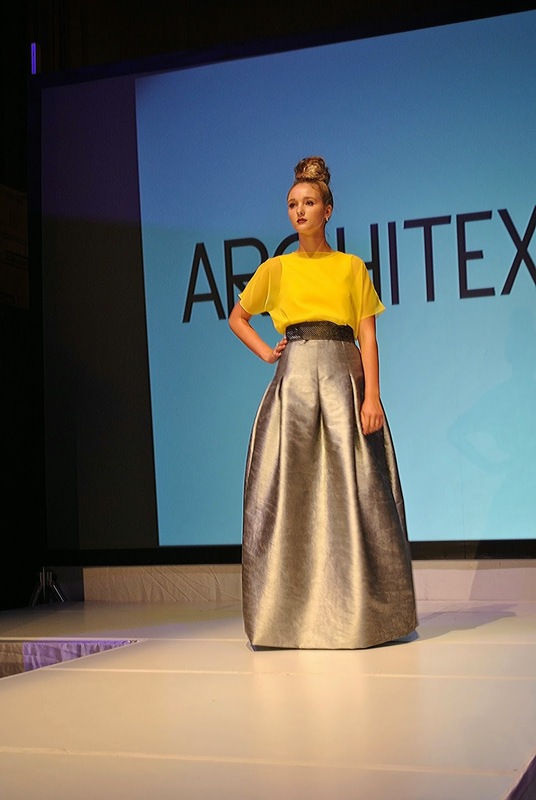 I loved how we each styled the pants so differenlty, yet in ways I can't wait to borrow! The only thing I can't borrow is the fabulous hair those girls sport! I have total hair envy! Can't wait to see what we do next month? Let me know if you have any suggestions or a trend you want to see us style! Sorry I'm not sorry that I'm wearing these pants again! And if I'm being honest, I wore them two days in a row! Seriously, like I said before, these pants rock!! A quick shout out to Pointer! The jacket was manufactured in my hometown of Bristol, Tennessee! Gotta love shopping local, even back in 1970! Go Dad!! I am kicking off this week with a little blog tour. I was asked by my sweet friend Lauren of, Classy and Fab Girl, to participate in a little tour of some of the blogs I love and to share them with all of you. I love this idea! I love sharing these awesome gals with all of you. They are pretty special. Just keep reading and you will find out why! Lauren, who you've met before, is an absolute doll! 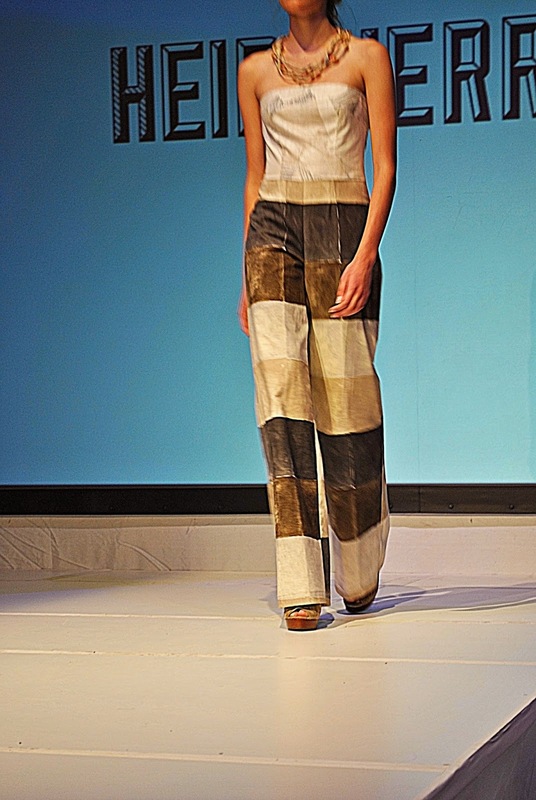 We met earlier in the year at Kansas City Fashion Week! 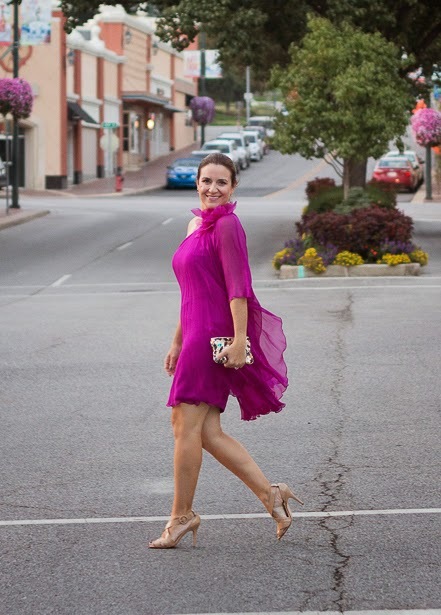 Recently, we have teamed up with Caitlin of Gussied Up for our monthly Tres Chic posts and I've loved getting to know her!! Head on over to see what she's been up to in the blogging world! I have a few things I would love to share with all of you before I introduce you to some of my other fav bloggers. I was provided a few questions about myself and my blog, and to be honest, I wasn't really sure how to answer them. I'm not even sure I answered them correctly, but here goes! 1) What Have I Been Working On? Growing a blog is nothing but work! I've been trying to grow my audience by honing in on who my target audience truly is and bringing them what they want. In the process, I'm still trying to stay true to who am and not lose my voice. That's the most important piece to all of this, right? 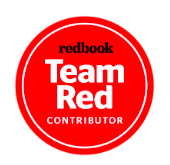 Also, I'm working with companies that I love and I'm excited about the opportunities! This is a great question and one I'm constantly asking myself. One main difference is that I'm 40! But, I think that I'm still relevant in fashion. And I try to convey that to all my readers who are my age or older. I can still be trendy and edgy, I just keep it age appropriate. My before and after posts are another way I differ. I preach to my readers that shopping from your closet is just as important as shopping from your favorite retailer. And that you can shop on a budget with my Dream to Reality post. I want to inspire you! Because I love it! Fashion has always been my passion. I discovered lay-away in my early teens, and I remember finding chores around the house or taking on extra babysitting jobs so I could have the funds to buy clothes. I've styled my mom for years, worked in retail to share my styling tips and tricks with the masses, and now I style myself in hopes of being your virtual stylist. It's simply a love of creating daily looks, writing about how I put it all together, and sharing this love with all of you! The writing is the easy part. You just write about what you know. The creating piece is the most difficult. I honestly stand in front of my closet most days and repeat the same mantra as almost everyone else "I have absolutely nothing to wear." And that's simply not the case! Most days it starts with one piece, the focal piece, and I create the look around it. It could be shoes. It could be a top. And it just snowballs from there. 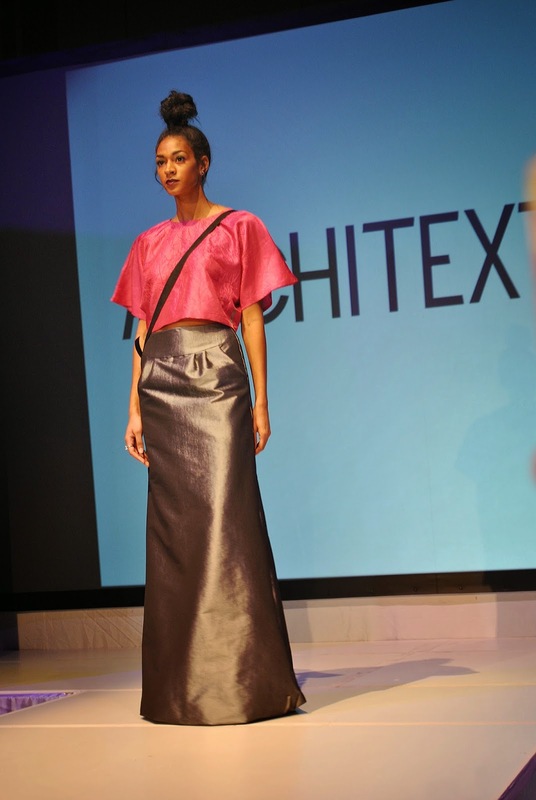 I have to say, most of my favorite looks come from those moments when I'm just ready to throw in the towel! Ngan is the jewelry artist behind eNVe Designs. From hand selecting the raw materials, to designing, then meticulously crafting each piece, she is the only one involved in every step of the way. Jewelry design has always been a passion and life-long hobby for her. This hobby evolved into a growing business with the birth of her first child and the choice to become a stay at home mom. In jewelry design, she is self-taught and always strives to learn something new. This is only the beginning, with exciting things to come! This is Jana of Jana Style Blog. I met Jana last year via Twitter and in person that same day at the Rebecca Minkoff event at Halls. Jana knows how to work that camera and busts out some of the best poses when we're out taking blog pics together. 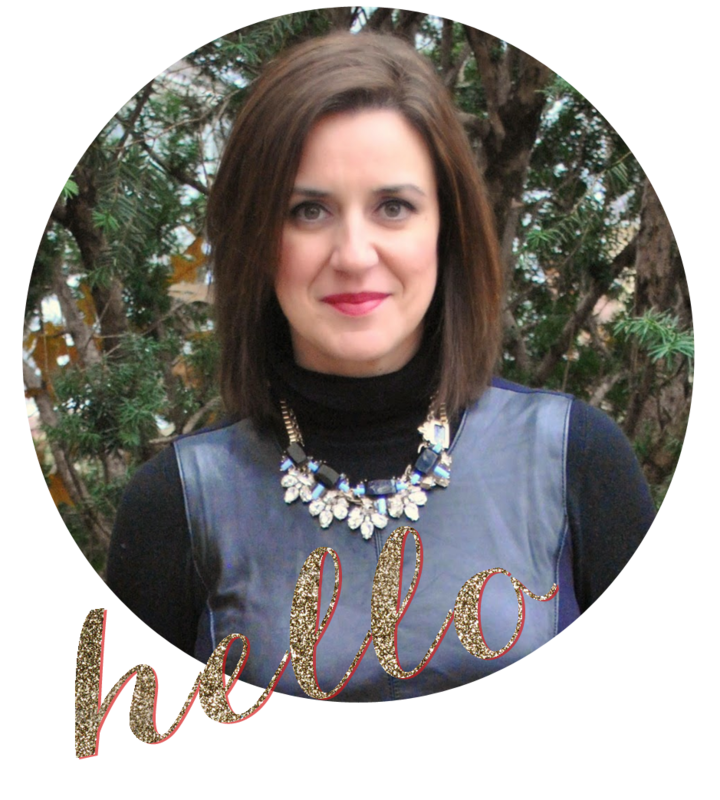 She's Co-Regional Director of Fashion Group International Kansas City and has really started to see her blog grow! She recently had a photo featured in InStyle Magazine's September issue, she's styled for several Kansas City runway shows, and also some magazine photo shoots. 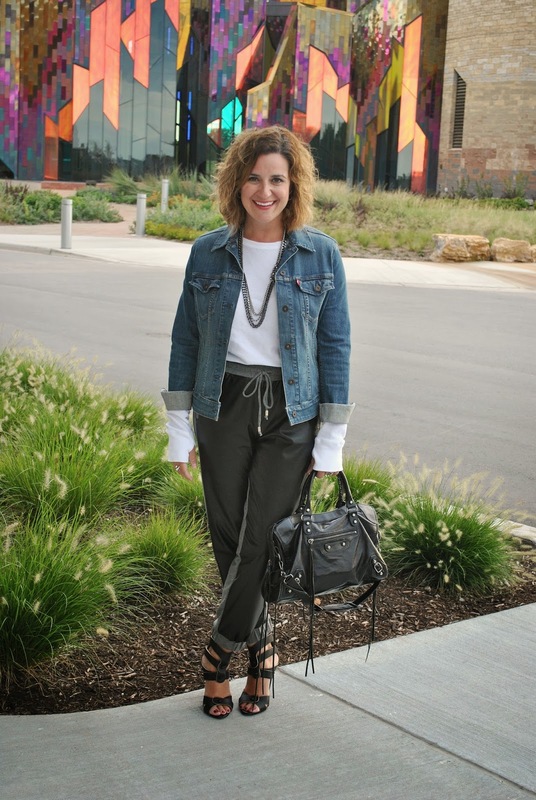 And, she was most recently named the official stylist and blogger for Summit Fair Shopping Center, the 500,000 square foot outdoor lifestyle center featuring Macy's, JCPenney, Buckle, WHBM, Loft, Maurices, Charlotte Russe, and Charming Charlie, just to name a few! 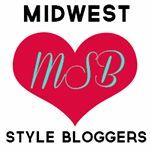 I hope you add these ladies to your blogger feed! Their stories, personal style, and creativity are just a few of the things that make them so special! Happy Monday! 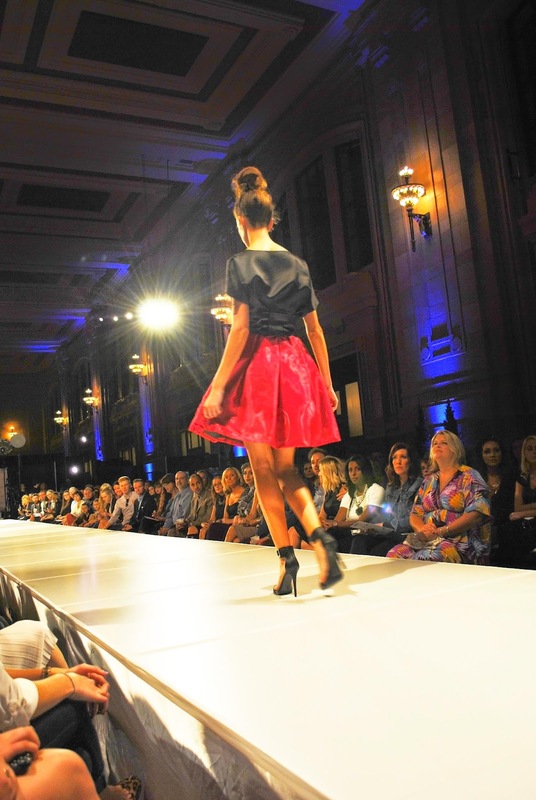 It's the start of Fashion Week here in Kansas City and I can't wait to bring you all the amazing details!